Since RKB boards were launched in 2008, all models have undergone a re-styling. Our new RKBs (Radical Kite Boarding) are equipped with sandpaper grip pads instead of the old rubber ones. This new pads provide a greater grip, are easier to clean and more durable. Their new redesigned graphics and deck-colour rims will impress every rider. The inner tube materials have been improved to offer greater puncture resistance; thus, a flat tyre in the most demanding conditions will be more unlikely. The RKB R1 is ideal for lower weights. 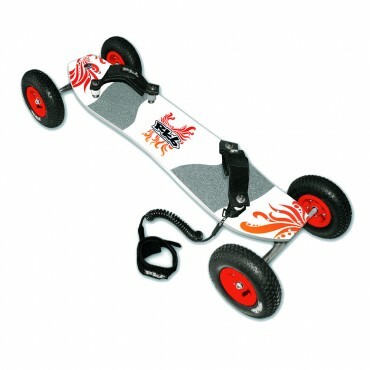 Perfect for beginners, as this board is very easy to drive. 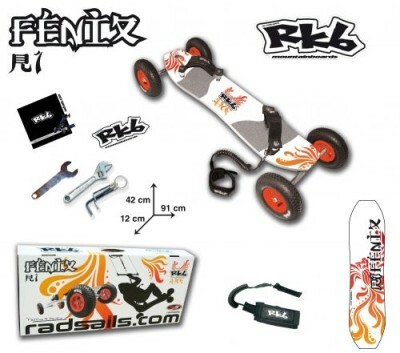 Being manufactured with high quality materials, this board will make the rider possible to perform his/her first freestyle tricks with power kites.